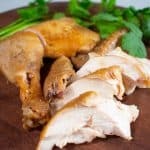 This very easy 6 ingredient Shanghai Chicken can be served hot or at room temperature and is a homey chicken dish all year round. Put all items into a pot except chicken. Stir to combine the liquid with sugar. Add the chicken breast side down. The chicken will only be half submerged in liquid. Bring to a simmer and cook at a very low boil for 30 minutes, covered. Flip bird breast side up. Simmer for another 20-30 minutes until the chicken is cooked but not overcooked. It should reach an internal temperature of 160 when a thermometer is inserted into the thickest part of the thigh. Remove from liquid and serve. The cooking liquid can be cooled, refrigerated, and used again if desired. If using bone-in chicken parts instead of a whole chicken, reduce cooking time by half.